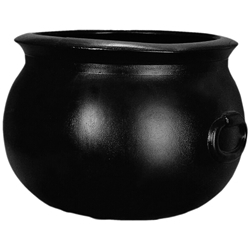 Black plastic cauldron/kettle for witches, wizards, set pieces, etc. Available in 3 sizes: 8", 12", 16" . Please note: The 16" cauldrons or multiple quantities in any size may require special shipping. Please call for more shipping information.